The Wilson Park Pool is open Memorial Day weekend through Labor Day. To view a schedule of pool hours, click here. Tucked into one of Fayetteville's most popular parks, the Wilson Park Pool is surrounded by shade trees and beautiful landscaping. The pool provides a very pleasant atmosphere for your swimming experience. 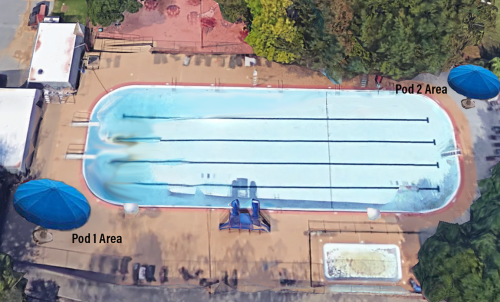 Fayetteville's only municipal pool is operated by the Parks and Recreation Department and offers recreational swimming, instructional swim lessons, fitness opportunities, and family swim times. Concessions are available. For more information, please call the pool house during the season at 479-442-2641 or the Parks and Recreation Department office during the off-season at 479-444-3471. Youth rates apply to those 15 years of age or younger. Children under the age of seven must be accompanied by a person sixteen years of age or older. Children under the age of one are free. Fayetteville Parks and Recreation uses the American Red Cross curriculum for our swimming lessons. These lessons are available to children and adults of all skill levels. Lessons are 30 minutes in length and run in two week increments Monday - Thursday, with Friday reserved for weather related make-up sessions. There are 5 sessions available throughout the summer. Each session has 4 time options (9:45-10:15am, 10:20-10:50am, 11:00-11:30am or 5:00 - 5:30pm). The cost is $50 for a 2 week session. Parent Tot (ages 6 months to 3 years): The purpose of parent and child aquatics is to teach safe behaviors around the water and develop swimming readiness by leading parents and their children in water exploration activities with the objective of having fun and becoming comfortable in, on or around water. Preschool (ages 4 & 5 years old): Preschool aquatics aims to promote the developmentally appropriate learning of fundamental water safety and aquatic skills by young children. Level 1: (ages 6 & older): Introduction to water skills. Orients participants to the aquatic environment and helps them gain basic aquatic skills. Helps participants begin to develop positive attitudes and safe practices around water. Skills: put face in water, blow bubbles, stay under for 10 seconds. Level 2: (ages 6 & older): Builds on the basic aquatic skills and water safety concepts learned in Level 1 Skills: Level 1 + flutter kick with feet, paddle with arms, float on back and stomach, jump into deep water. Level 3: (ages 6 & older): Comfortable in water and possesses basic abilities to swim. Skills: Level 2 + dive from side of pool, dive off board, display some form of elementary backstroke, front-crawl, back-crawl. Online registration will open March 4th for the 2019 Pool Season. Swim lesson registrations are non-refundable, unless otherwise approved by Program Manager. Fees may be transferred and applied to another lesson slot, if space permits. All transfers must fall within the same pool season. All refunds will accrue a 10% administrative fee. Register Online for Swim Lessons! Private (After Hours) Full Pool Rental - Rent the entire pool for a private pool party! Prices start at $200 for 2 hours. Max of 400 people. Private (After Hours) 1/2 Pool Rental - Share the pool with another group for a private pool party. Each group will have their own "Party Pod" area with a 20' shaded area for food, cake and drinks! Prices start at $100 with a Max of 200 people. Public Swim Party Pods - Reserve one of our two 20' shaded areas during Open Swim/Family Swim for groups of up to 25 people. $100 for 2 hours. Reservations open up on May 1st at 8am. Rentals can be made May 25th through September 1st. 100% of rental fees due at reservation. Wilson Pool can accommodate group reservations within normal business hours. Please notify the pool 5 days prior to ensure there are enough staff for your group. Wilson Pool Seasonal Number 479-442-2641. Off-Season Parks & Recreation Office number is 479-444-3471. The Wilson Park Wahoos summer developmental swim team is full of fun, skill building, and some friendly competition with other area summer league programs! This program replaced our level 4 swim lessons, as we bring in quality coaches, longer sessions, more sessions, and includes some FUN swim meets! Surface Wahoos - for 5-8 year old swimmers who can swim across the pool unassisted. The Wilson Park Wahoos is a recreational swim team that promotes swim skills and swimming endurance in a fun, team environment. Practices for the 8&under group primarily focus on the freestyle and backstroke skills with introduction to flipturns, diving, and the breaststroke and butterfly skills. Torpedo Wahoos - for 9-16 year old swimmers. It is recommended that child can swim across the pool unassisted, but this is not required. Your child will be assessed at their first practice. The Wilson Park Wahoos is a recreational swim team that promotes swim skills and swimming endurance in a fun, team environment. Practices for the 9&up group build on freestyle and backstroke skills while also becoming proficient in the breaststroke and butterfly skills. Swimming longer distances and refining dives and flip-turns will also be a priority. Register Here for Wilson Wahoos!